For the first time since 1967, Israel closed down al-Aqsa Mosque compound, following the assassination of a number of Palestinians. PNN reports that, as a result, there has been a civil uprising all across the occupied West Bank and Gaza. 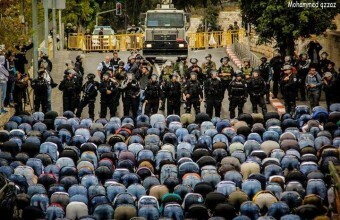 Israeli forces blocked worshippers from entering the mosque to pray, as hundreds gathered at the gates of the mosque, finally offering their prayers in the streets. Violent clashes have been taking place in Wadi Al-Joz and the Thawri neighbourhood, as well as the Qalandiya and Shu'fat areas in occupied East Jerusalem, were young men threw stones and burning bottles. Israeli forces have been responding with teargas grenades, rubber-coated metal bullets and sound grenades. In Wadi Al-Joz, a ten-year-old boy was injured in the head by a metal bullet, but his injury was reported to be slight. Forces in Silwan attempted to detain two Palestinian children, a two-year-old and a nine-year old, on suspicion of throwing rocks. Members of the Jaber family told Ma'an correspondence that once Israeli soldiers had found out the nine-year-old boy's name (Izz al-Din al-Qassam and also the name of a famous Palestinian national hero and used by Hamas as the name for its military brigades) they began questioning him. Israeli soldiers apparently attempted to detain the nine-year-old boy based on the fact that he had "colored rocks" in his pockets, presumably to throw at soldiers but, when searched, the child was in fact found to be carrying nothing but candy. Over the past ten years, Israeli forces have arrested, interrogated, and prosecuted some 7,000 children between 12 and 17, mostly boys, and at a rate of "an average of two children each day," according to UNICEF. The most violent of Friday's clashes reportedly took place at Qalandiya checkpoint, where Palestinian youth burned a military tower, while Israeli forces again responded with intensive teargas and metal bullets. In the Gaza Strip, a huge demonstration was launched following Friday prayers, in solidarity with Jerusalem. Read more, with additional photos, at the Palestinian News Network. At least 28 Palestinians were injured during clashes with Israeli forces which continued into the late hours of the night, on Friday, across Jerusalem. Activist Jihad Oweida told Ma'an that one mourner, Attiya Shabbaneh, was injured by shrapnel from stun grenades in his face, and was subsequently taken to al-Maqasid Hospital for treatment. Many suffered from excessive tear-gas inhalation while one received a fracture in his foot. A Palestinian youth identified as Rami Salah was detained by Israeli forces. An official from Red Crescent said that 28 Palestinians suffered from light injuries, while three were taken to hospitals after they were hit at close range with rubber-coated steel bullets in the head, legs, and stomach. Meanwhile, in al-Issawiya neighborhood, dozens also suffered from excessive tear gas inhalation, while unidentified Palestinian was reportedly detained. AFP reports that a rocket was also said to have been fired from Gaza, hitting an open area in southern Israel on Friday, according to the Israeli army. No casualties or damages were reported. It is the first rocket from Gaza to be reported since September 16. Al-Aqsa reopened on Friday, with hundreds of additional police deployed in the area, preventing entry for Muslim men under 50. Dozens of Israeli military jeeps invaded, on Saturday at dawn, a number of towns south of the northern West bank city of Jenin, installed roadblocks, and broke into a number of homes and lands before searching them. Media sources in Jenin said the soldiers invaded the towns of Ya’bad and Wadi Da’ouq, stopped and searched dozens of cars and interrogated the residents while inspecting their ID cards. The soldiers also conducted military searched in the two towns. Soldiers also invaded Ya’bad town after installing a roadblock on its main entrance, and conducted searched in the al-Malloul neighborhood. A number of military vehicles also invaded Marka town, and searched a number of farmlands and various groves. Dozens of soldiers were also deployed in Wadi Da’ouq area, and ambushed several Palestinians in olive orchards; no arrests were reported. Palestinian medical sources have reported, on Friday evening, that four Palestinians were wounded by Israeli army fire near the Qalandia terminal, north of occupied Jerusalem. The injuries took place during clashes between Israeli soldiers and Palestinian youths who hurled stones and empty bottles while the army fired dozens of rounds of live ammunition, rubber-coated metal bullets and gas bombs. One of the wounded Palestinians, 14 years of age, was shot by a live round in his leg, while a 17-year-old Palestinian was shot by a live round in his abdomen, and was instantly moved to surgery. A third Palestinian, 23 years of age, was shot by a rubber-coated metal bullet in one of his eyes, and another Palestinian, 20, was shot by rounds of live ammunition in both of his legs. 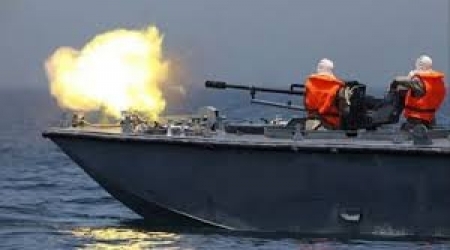 The Israeli navy opened fire on Wednesday morning, against Palestinian fishermen, and shot a young man off Beit Lahia shores, in the northern Gaza Strip. According to Al Ray correspondence, he sustained moderate injuries after being shot in the thigh and transferred to al-Shefa hospital. The Israeli navy has attacked Gaza fishermen several times since the Gaza ceasefire took effect, although the terms of the truce deal provide Israel stop its attacks and expand the fishing zone. Israeli soldiers kidnapped, on Thursday evening and on Friday at dawn, at least six Palestinians in different parts of the occupied West Bank, and occupied Jerusalem. One of the kidnapped is the head of the Wadi Hilweh Information Center in Silwan. Local sources in Zababda town, south of the northern West Bank city of Jenin, has reported that the soldiers kidnapped one Palestinian and searched several other homes. The sources said the soldiers kidnapped Aysar Ibrahim Turkman, 30, after storming and ransacking his home, and several nearby homes, and took him to an unknown destination. Several soldiers also surrounded the home of former political prisoner Ahmad Sharqawi, and interrogated him while searching and ransacking his property. They also conducted searches in different parts of the town. 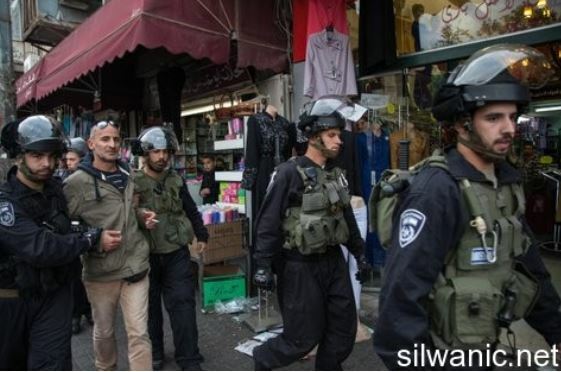 The Wadi Hilweh Information Center in Silwan, in occupied Jerusalem, has reported that the soldiers kidnapped the center’s head Jawad Siyam, his nephew Yazan Siyam, and two other Palestinians identified as Mahmoud Gheith and Montaser Faraj. 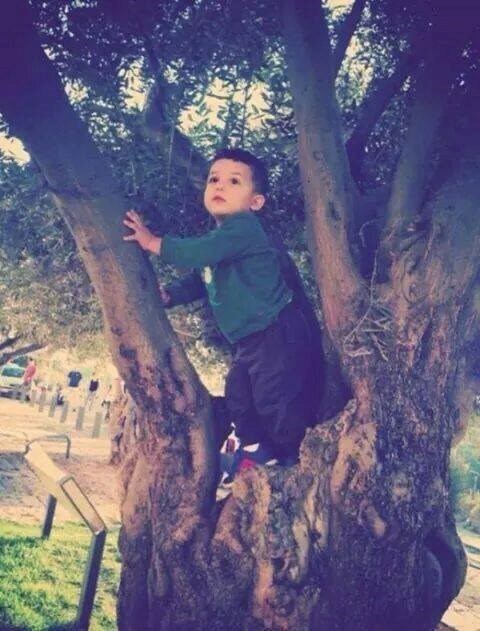 The Center said the kidnapped were moved to the al-Maskobiyya interrogation center in West Jerusalem. 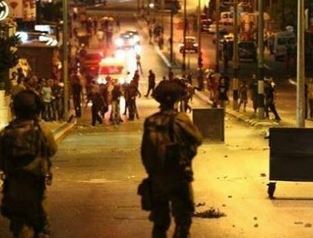 On Thursday at night, soldiers invaded the Sawahra ash-Sharqiyya town, east of Jerusalem, and kidnapped a young man. Israeli sources said the soldiers searched the house of the kidnapped Palestinian, and allegedly located two Kalashnikov rifles and a pistol. On Thursday evening, clashes took place between dozens of Palestinian youths and Israeli soldiers invading the ‘Aida refugee camp, north of the West Bank city of Bethlehem. Local youths clashed with the soldiers and hurled stones them and their military tower of the Annexation Wall, while the army fired gas bombs, concussion grenades, and rubber-coated metal bullets. 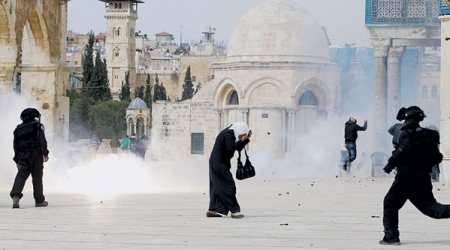 Provocations by Israeli soldiers and settlers continued in the occupied Palestinian territories, on Wednesday, with multiple violations occurring across the West Bank and East Jerusalem, while militant Jewish settlers again broke into al-Aqsa Mosque via the Mughrabi gate. Masked Israeli forces were reported to have brutally attacked a 13-year-old elementary student before taking him into custody from inside his school, in the old town of Hebron, according to the student’s father, Arif Jabir. Mr. Jabir told WAFA Palestinian News & Info Agency that forces raided the school, attacked and severally beat his son Bara’a before leading him out of the school in a brutal manner and using foul language. The soldiers violently forced Bara’a into the back of a military jeep, severely bruising his body. He was transferred to a hospital for treatment. WAFA notes that educational facilities, including students and teachers, are not spared from Israel’s regular attacks, including obstruction of access to schools and the violation of the right to education. During the recent 51-day military assault on the Gaza Strip, Israeli forces bombarded a number of schools, including those run by the UN -- a serious violation of international law. Israeli forces, on Wednesday, also demolished several structures used for housing and livestock, in addition to a traditional oven in Yatta town, to the south of the Hebron and Jerusalem districts, according to local activist Rateb Jabour. Mr. Jabour, who is coordinator of the local anti-wall and settlement committee said that a large Israeli force, backed by bulldozers and military jeeps, broke into Khashem al-Daraj, where they cordoned off the area and demolished a residential structure, a cave, an out-door toilet facility and a livestock shed, all which belong to Mustafa, Mousa and Eid al-Tibni. Jabour slammed the demolition as an ‘arbitrary act of revenge’ perpetrated as part of Israeli plans to displace Palestinians and illegally replace them with Israeli settlers. Meanwhile, forces demolished a traditional tabon (oven) in the village of Umm al-Khair, to the east of Yatta, under the pretext that it disturbed Israeli settlers from the nearby illegal settlement of ‘Karmiel’. Mr. Jabour additionally stated that Israeli forces demolished a traditional oven for the second time in just a week, under the pretext of unlicensed building. Forces brutalized anyone who attempted to confront them and save the oven, inflicting multiple wounds and bruises on several local residents. The tabon provides bread for the family who owns it, as well as for other members of al-Hathalin family. Israeli settlers frequently harass Palestinian locals. Last February, a settler from ‘Karmiel’ filed a lawsuit claiming that he, along with his family, suffer from the smoke emitted by the oven and requested a compensation of some $72,000. To the west of Salfit, in the occupied West Bank, Israeli forces raided the town of Qarawat Bani Hassan, where they kidnapped five Palestinians after inspecting their homes. The Salfit governorate issued a statement which identified the five as Majd Nassim Assi, 23, Ali, 20, Ahmad 22, Layth, 19, and Muhammad Rayyan, age19. Governor of Salfit, Mr. Issam Abu Bakr, denounced the raiding and inspection residents’ homes, as well as the arrests which followed. He said that most of those who are arrested by Israeli forces are youth and children. According to the Euro-Mediterranean Human Rights Network, Israel has arrested a total of 3,000 Palestinian children since 2010. Abu Bakr noted that such actions appall residents and deprive children from living a normal life. He further called on human rights organizations to take urgent action in stopping all aggressive Israeli practices against Palestinians in the Salfit district. Meanwhile, in Jerusalem, Israeli police, accompanied by West Jerusalem Municipality bulldozers broke into Silwan, where they demolished the a cave-like structure used as a shelter by a Palestinian family. The cave is located in a plot of land belonging to Khaled al-Zir, who, together with his family, were forced to take shelter in the cave following the demolition of their house, again under a pretext of unlicensed building. Khaled and his relative, Fahmi, were both brutally assaulted and abducted, following a confrontation with Israeli troops as they attempted to stop the demolition process. According to the Applied Research Institute of Jerusalem, the residents of Umm al-Khair are originally Palestinian refugees who were driven out from their original homeland of ‘Arad and Beersheva in 1948. WAFA further reports that the residents of this village, as well as those of Khashem al-Daraj, are mainly dependent on agriculture for their livelihood. More than 85% of the residents are engaged in agricultural activities, especially animal husbandry. Jewish militant settlers again broke into al-Aqsa Mosque through the Mughrabi gate, on Wednesday, as well, touring its yards in a provocative manner under the protection of Israeli police, said witnesses. Israeli police were stationed at the gates of al-Aqsa, where they imposed strict measures on worshipers who wished to enter the compound, seizing identity cards and returning them when they had left the compound. Witnesses told WAFA that Israeli police, on Tuesday evening, also stormed al-Aqsa, raided al-Marwani Mosque, and seized the back packs of students who study there. Furthermore, several extremist Jewish organizations which call for the demolition of al-Aqsa Mosque and construction of the “Jewish Temple”, have reportedly organized a conference under the title of “Israel Returns to the Temple Mount”. The conference coincides with the Jewish event which celebrates a group of Jews' journey of prayer at what they consider to be the 'Temple Mount', set to be held in the presence of high ranking Israeli figures, right-wing parties and members of various “Temple Mount” extremist groups. The ceremonies celebrating this event will last for an entire week. Jewish groups have called for a mass raid of al-Aqsa Mosque, during which they are expected to perform provocative tours and prayers. According to sources, they aim to schedule a program for the Jewish Students of the Temple and Israeli rabbis to visit al-Aqsa compound. Jews hold al-Aqsa to be the site of the first and second temples, with a number of advocates attempting to recruit Christian groups (mostly of Western denominations) into the campaign, with some having gone so far as to suggest bombing the mosque. Escalating attacks against both Islamic and Christian holy shrines in Israel and the oPt now total over 500, in just the past five years. A number of churches have since taken up the cause of the international Boycott, Divestment and Sanctions movement in response to the violations by both Israeli authorities and settlers in this regard. Pope Francis, on the last day of a recent 3-day pilgrimage to the Holy Land, called for allowing all believers free access to holy sites in Jerusalem. The mounting tension in the Old City of Jerusalem has sparked numerous violent confrontation between Palestinians and Israeli settlers backed by police. Al-Aqsa Mosque is currently administered by Jordan, according to a treaty signed between Jordan and Israel in 1994, WAFA further notes. As the main custodian of all Muslim and Christian sites in Palestine, Jordan expressed concerns over calls by several prominent Israeli officials to take over the sovereignty of the holy site. According to media sources, a debate held in the Israeli Knesset, introduced under the title “The Loss of Israeli Sovereignty Over the Temple Mount”, was initiated by Moshe Feiglin, a Jewish far-right member of PM Netanyahu’s Likud party, to take control of al-Aqsa Mosque. Israeli forces, on Wednesday, abducted at least nine Palestinians from the occupied West Bank districts of Jenin and Nablus, while taking on youth from the Jerusalem area, according to reports by local and security sources. 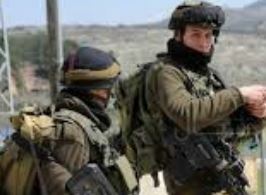 Israeli soldiers kidnapped three Palestinians in the town of Qabatiya, to the south of Jenin, after raiding and searching their families’ homes. They were identified as Ibrahim Sabaghneh, 53, Tariq Abu Elrob, 20, and Asyad Zakarneh, 22. Forces also took Bilal Sharqawi and Ahmad Torkman, both from the town of Yabod, while they were present at ‘Dotan’ military checkpoint, near Jenin. Meanwhile, forces detained and interrogated two brothers from the same town, for hours, before releasing them. WAFA further notes that the town of Yabod is a target destination for daily Israeli raids and arrest campaigns, leading to regular confrontations, the last of which took place on Tuesday, where four Palestinian youth were shot with live ammunition; one of the injured is reported to be in critical condition. In the town of Jaba’a, forces abducted two brothers; Mahmoud and Mohammad Khalilyeh, 35, 45, respectively, and Nayif Hamammreh, 30, following a raid on their homes and motor shops, where they confiscated a motor bike and several car parts. In Nablus, forces took into their custody 31-year-old Samih Jaber, from the town of Aqraba, to the south, after raiding his family home. In occupied East Jerusalem, special police units further raided the town of Silwan, to the south of the Old City, where they took Morad Ghaith, who was taken to an interrogation center in Jerusalem. Police also kidnapped Sameera Edrees, from Jerusalem, as she tried to leave al-Aqsa Mosque from one of its main gates; she was subsequently led to a police station in the Old City. The police additionally arrested an elderly at the compound. His identity remains unknown, but he was reportedly taken for chanting religious slogans and attempting to fend off settlers’ who broke into the holy compound. According to guards who work at al-Aqsa Mosque, Israeli police seized worshipers’ identity cards at the main gates and referred many of them to a detention center for further interrogation. See this week's Opinion/Analysis section for further information on the escalating violence in the occupied Palestinian territories.